In the era of the remix and the mashup, the way the designer Fornasetti worked and reworked this same face is inspirational. The serene face so endlessly repeated is that of Lina Cavalieri, an Italian soprano renowned for her beauty. I’ve long loved his work – have got a book (the library has it too – Fornasetti: Designer of Dreams) a Swatch watch and Marion O kindly scored me a brooch in Melbourne featuring my favourite image – the face in armour. Flickr has some cool images with the Fornasetti tag. 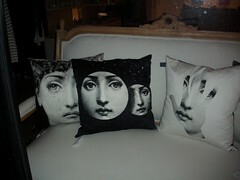 This week I spotted these cushions in Annex in Victoria Street – and realised Trade Me might be worth a look. There are some badges, plates and necklaces for sale. I’m plumping for the badges – after a hot auction where the price skyrocketed, they came again on a ‘buy now’ so I leaped on in.